'Garden centres and flower shops are two of my favourite places in the world - I feel calm the moment I walk in. The scent of the flowers, the greenery, the wholesome wooden tools, the exotic orchids...Throw an antique shop into the mix and I'm in decorating heaven.' Willow Crossley. 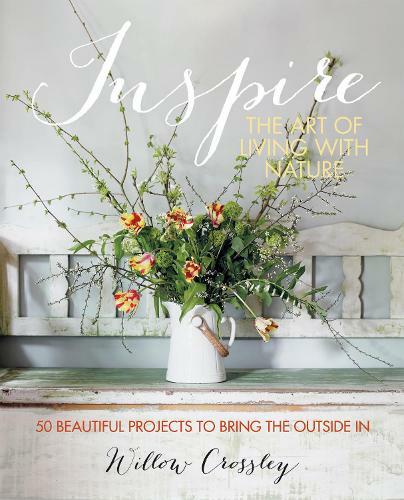 In Inspire: The Art of Living with Nature, Willow combines these passions and shows how to use both flower-shop purchases, beachcombing bounty, home-grown harvests and hedgerow finds foraged on countryside walks to decorate your home. Divided into five chapters on Woodland, Flora, Fauna, Edibles and Beach, here are more than 50 ideas ranging from hellebores displayed in test tubes to a wreath made from hydrangeas, spring narcissi planted in wooden wine boxes, a tabletop display incorporating apples and pears, displays of pebbles, coral and shells, sea urchins fashioned into napkin rings, hollowed-out red cabbages used as vases, a colourful posy of chillies and a stylish wall display of antlers and feathers.